Smart heating expert Drayton has teamed up with Trusted Reviews to offer two lucky readers the chance to win a Wiser home heating bundle, worth £270! The prize includes a Wiser Multi-zone Kit, including Heat Hub, room thermostat and two intelligent Red Dot award-winning radiator thermostats, plus the brand new Wiser Plug. Wiser by Drayton is an innovative yet affordable multi-room smart heating system, which allows you to view and control the temperature in up to 16 different rooms, all via the handy Wiser Heat app. By only heating the rooms you’re using to the temperatures you like, you can lower your energy bills and make your home comfortable for the whole family. Wiser integrates with other smart devices, including Amazon Alexa and The Google Assistant for voice control, and IFTTT for features like geofencing that will turn your heating off, when the last member of your family goes out. What’s more, clever features like Eco Mode learn how long your home takes to react to temperature changes, ensure you never waste energy by over-heating your home. Simple to install, Wiser works alongside your existing heating system with no need to alter pipework or valves, and the system is buildable too, so you can easily add more radiator thermostats over time. Wiser has become even smarter this winter, with the launch of the new Wiser Plug. 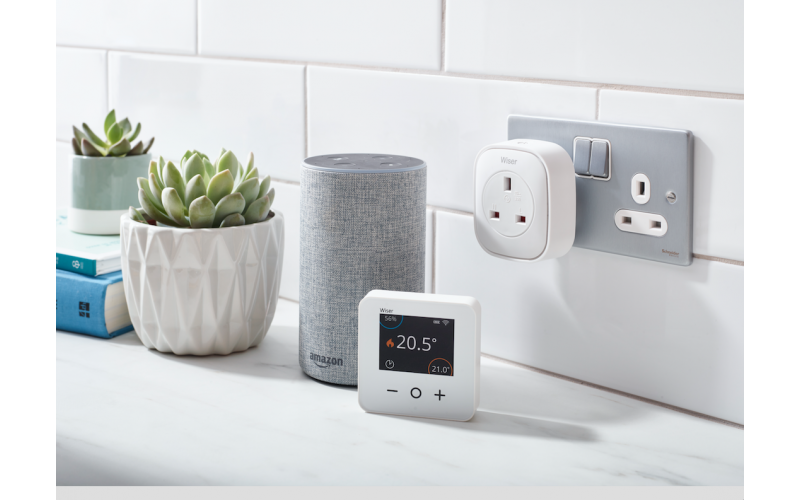 Up to 10 smart plugs can be controlled from the same Wiser Heat app, giving you the freedom to set schedules for electrical devices such as lights and slow cookers or turn them on and off via your smart phone from wherever you are. Never worry about leaving the hair straighteners or iron on again.